Bill Smith’s visit brought out the dragonfly enthusiasts in Bethel. He lead a Saturday morning walk called. Bugs, Birds and Berries. 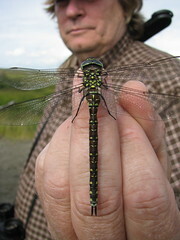 There 8 species of Odonata in Bethel. Bill found 4 range extensions. I wish I had heard of the visit. This time of year the dragons and damsels are most prominent and I try to get the neighbor kids interested. I haven’t seen the one illustrated but did record a bluet at Grassroots Science. I think I’ve seen the state insect. I photographed a dragonfly color equivalent of the bluet but not yet posted. When I do maybe you can help me identify it. The Odonata around here are fascinating, if you can catch them still.